Ryan and I have a favorite little friend, Edward, who is the three year old son of some of our good friends. We've known him since birth (celebrated his first birthday with ice cream cupcakes!) and have loved watching him grow up into the sweetest little boy. If this baby kicking away in my stomach is a boy (and I suspect it is), I want him to be just like Edward! 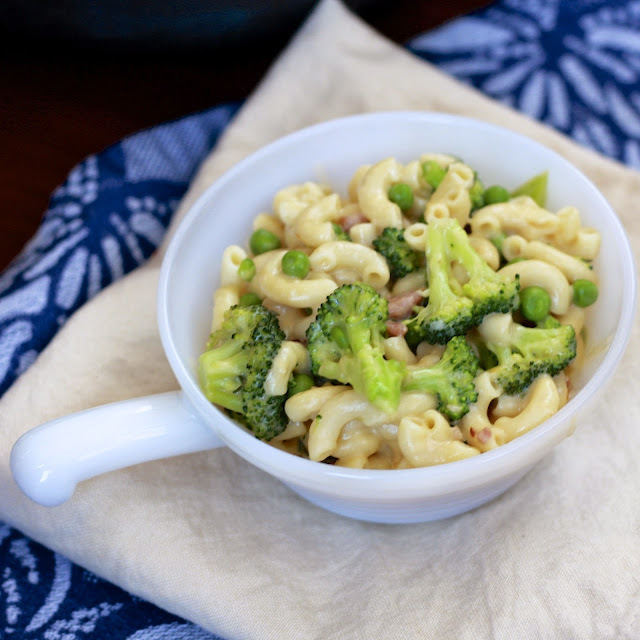 Edward's favorite meal is mac and cheese, so I couldn't help but think about him as I prepared this for dinner one evening. It's a bit of a sophisticated take on the kid-friendly classic. There's still plenty of cheese, but also bacon and thyme and green veggies (the peas were my addition, and I loved them in there!). The Worcestershire and mustard add a savory tang that even my mustard-skeptical husband was a fan of. Cooking Light nailed this recipe, both in taste but also preparation method. 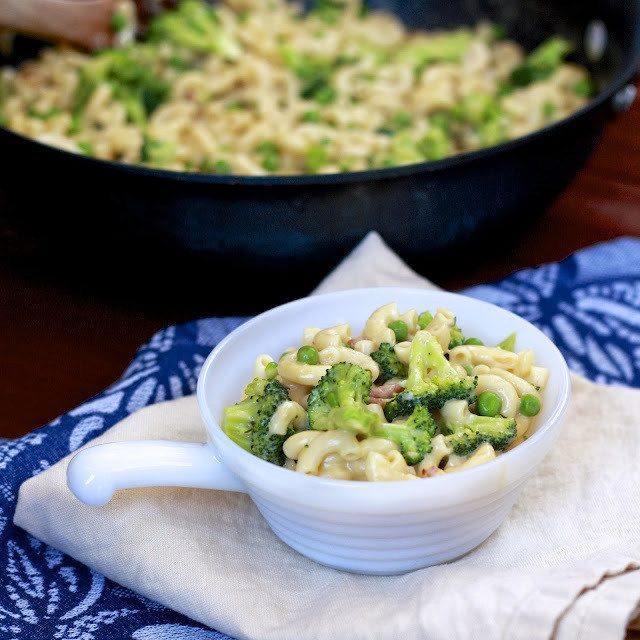 It comes together quickly on the stovetop and is a great one-dish meal! Next time Edward comes over, I know what I'm making him! 1. Cook pasta according to package instructions, omitting the salt and fat. 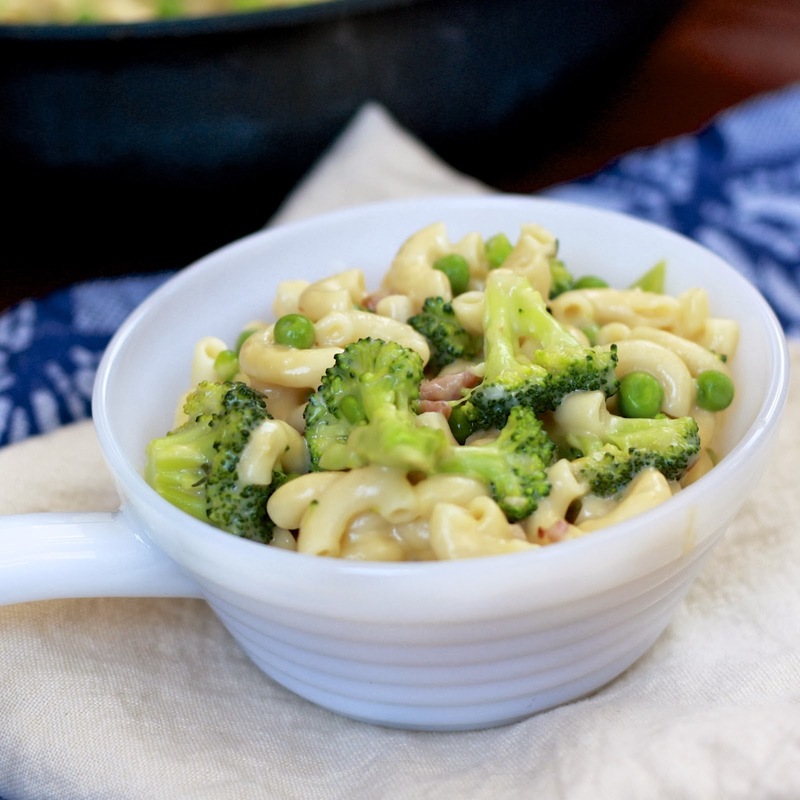 Add broccoli and peas during the last minute of cooking. Cook for 1 minute, then drain. 2. Combine milk, flour, thyme, mustard, Worcestershire, and salt in a medium bowl, stirring with a whisk until smooth. 3. Heat a large skillet over medium-high heat. Add bacon and cook until crisp. Add butter to the pan, swirling until melted. Add milk mixture to the pan and bring to a boil; cook for 1 minute, stirring frequently. Stir in the cheese until melted. 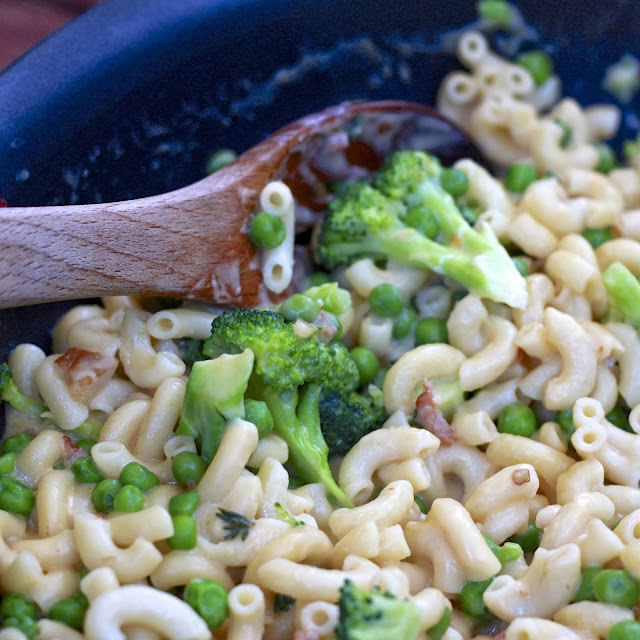 Add the pasta and veggies to the pan, tossing to coat. Serve immediately.